Checkpoints in Diablo 3 function similar to respawn points in FPS games. Players who die appear back at the last checkpoint they reached, usually at the stairs that they took to reach the current level, or the closest chokepoint that separates two outdoor levels. 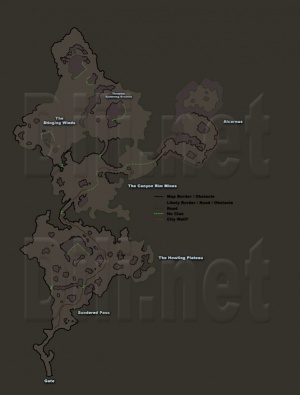 Checkpoints visible on the map from BlizzCon 2009 snippet of Act II. Checkpoints are not spots on the ground that must be clicked, like waypoints. They aren't visible in the game at all, until your character passes through one, at which point a "checkpoint reached" title pops with flashing graphics. Checkpoints are designed to save players time and effort when they die, allowing their character to quickly rejoin the party and continue the battle. Players restart at the last checkpoint they passed through, fully equipped and recovered in health. Checkpoints are common enough that a character seldom requires more than a minute to run from one to the site of their death. In Cellar of the Damned - After killing Haedrig's wife, Mira. Just outside Tristram at the end of the bridge into The Weeping Hollow. Just beyond the gates of the Cemetery of the Forsaken. Inside the entrance to the Chancellor's Tomb - Just after you have killed Manglemaw. After returning the crown to Haedrig in Tristram. Inside the entrance of The Royal Crypts. Just before entering the Ornate Door to the Crypt of the Skeleton King. After killing the Skeleton King. Returning to Tristram with the Stranger. After speaking with Cain about the Stranger. End of the bridge from Cemetery of the Forsaken into Fields of Misery. Outside entrance to Khazra Den. After handing in the sword shard to Deckard Cain. As you approach the slope up from Fields of Misery to The Old Mill. After activating the Waypoint just before the Drowned Temple after talking to the Scoundrel. Just across the bridge that Alaric raises for you from the Drowned Temple to The Festering Woods. Just inside the entrance of Warrior's Rest and Crypt of the Ancients. Just back across the bridge from The Festering Woods to the Drowned Temple once you have collected the Beacons. After entering the Drowned Temple. After killing the unique brothers in the Drowned Temple. After returning to Tristram with the sword shard. Just outside, and just inside, the entrance of the Caverns of Araneae. As you approach the Chamber of Queen Araneae. Once you have found Karyna's Lost Wagon. Once you've opened the Khazra Barricade. As your approach Leoric's Hunting Grounds in the Northern Highlands. At the Iron Gates to Leoric's Manor Courtyard. After you've killed Maghda's minions in the Manor.